This year EuroPride comes to Sweden, being held in double cities Stockholm and Gothenburg. The whole concept of LGBT Pride has taken strong root in Sweden, and many towns up and down the country hold their own celebration. For example, today is Springpride in the midland city of Eskilstuna. Currently there are 73 Pride festivals in Sweden during the year. From Arctic Pride way up in the north to Malmö Pride in the south, it is possible to celebrate throughout the year. Swedes seem to have embraced the concept of Pride with open arms. There is, of course, a commercial benefit but the main reason seems to be that LGBT Pride resonates well with the societal Swedish values of equality, tolerance and acceptance. However, like everything, it has its opponents. Right wing groups occasionally organize counter demonstrations or, as in Eskilstuna yesterday, decide to put up homophobic, anti-Pride propaganda. Thankfully, these groups are small and as long as the majority of Swedes continue to stand up for Pride, they have little impact. If you’d like to know where a Pride is near you, go to http://www.svenskapride.se which collects all the National events in one place. Sweden is internationally known for its tolerance and openness and this means Stockholm is a great city to live in for members of the lesbian and gay community. However, visitors to the Swedish capital might be disappointed in the size of the gay scene. Where many other capital cities have gay neighbourhoods, or lots of gay and lesbian restaurants, cafés and bars to choose from, Stockholm's choices are limited. One of the reasons for this is that the very tolerance and acceptance that exists in the city has led to a a general integration into the mainstream. Where other places around the world have needed to develop a strong and powerful subculture, it seems to have been less important in Sweden. This means that in Stockholm most places are mixed. However, there are today a couple of bars, Torget in the Old Town is aimed and a young twinky fashionable crowd and Side Track on Södermalm aimed generally at the older and bear crowd and SLM for the fetish crowd. If you want to strut your stuff, a few clubs nights exist such as Patricia, Candy and Wonk. For a nice cup of coffee or a bite to eat head towards gay cafe restaurant Adams Bistro in the Odenplan area. Other than occasional parties and club nights, there's very little just for lesbians and unfortunately nothing apart from interest groups exclusively for the transgender community. In the summer half of the year, the very popular outdoor bar/restaurant Mälarpaviljongen opens its doors and is well worth a visit to take in beautiful Stockholm views and beautiful Stockholmers. For more information on venues grab the gay rag QX or visit http://www.qx.se. Also check here for gay beaches, gay-friendly beaches and cruising areas such as Långholmen, Frescati and Kårsön. 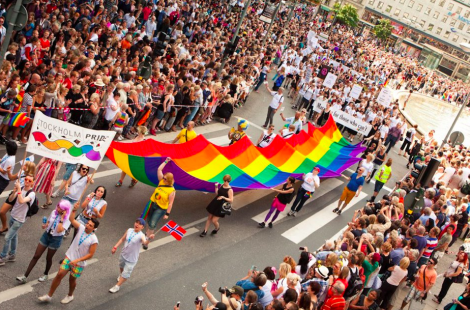 Once a year, Stockholm organises the biggest Pride festival in Northern Europe. Usually on the first weekend in August, Stockholm Pride is a real carnival and succeeds in balancing the playful, the sexual and the political. The festival attracts up to 60000 participants who take to the streets in pride. Pride week is usually packed with club nights and parties and definitely worth a visit. But LGBT living isn't only about parties and festivals. In Stockholm's community there is a plethora of things to occupy yourself with. If you enjoy singing, you can listen to Stockholms Gay Choir, the oldest gay men's choir in Europe. They give concerts twice yearly at Christmas and in the spring and are well worth the modest entrance fee. If exercise is your thing, then Stockholm's gay rugby team Stockholm Beserkers are a good option. On frequent Sundays they compete, and they practice on Monday and Wednesday evenings on Årstafältet if you want to go along.